Tolga Salman received his music education in Turkey and Germany. 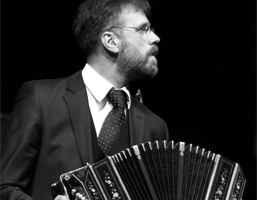 Influenced by the masters of tango music like Astor Piazzolla, Dino Saluzzi and Orhan Avşar, he focused his efforts on bandoneon. In the meantime, he met bandoneon masters like Dino Saluzzi, Hector Ulises Passarella and broadened his repertoire following their suggestions. Salman and his brother violoncellist Koray Salman founded Salman Duo and gave a concert with Hector Ulises Passarella Orchestra under the auspices of Fedele Fenaroli Foundation in Lanciano, Italy where they interpreted concert tangos from 1940’s and 1950’s. He performed as a soloist with Orchestra Akademik Başkent, Bozok Ensemble, Tangoroma, NDS Orchestra’Sion, Tolga Salman-Orçun Orçunsel Duo, Tolga Salman-Rustam Rahmedov Duo, Kağan Korad-Tolga Salman Duo, Cellistanbul, Yaşar University Chamber Music Orchestra, Ensemble Nodus, National Reassurance Chamber Orchestra, Anadolu University, Eskişehir Metropolitan Municipality, and Antalya, İstanbul and İzmir State Symphony Orchestras. He worked with famous conductors, including Hector Ulises Passarella, Ertuğ Korkmaz, Antonio Pirolli, Ender Sakpınar, Andrew Greenwood, Orçun Orçunsel, Alessandro Cedrone, Münif Akalın, Hakan Şensoy, Stefano Mazzoleni and Patrycja Pieczara. He gave concerts figuring predominantly the tango nuevo of Astor Piazzolla with famous composer and pianist Fazıl Say in İstanbul and Antalya. Tolga Salman has been invited to give solo concerts at the Bandoneon Festival organized by annually since 1996 by Krefeld Municipality Culture Office in Krefeld, Germany which is assumed to be the place where the first bandoneon was produced. With Ensemble Nodus, the artist performed in the Turkish premiere of Tango Aleman, a Carlos Gardel parody by the German-born Argentinean composer Mauricio Kagel. Again, Tolga Salman performed in the Turkish premiere of “Misa a Buenos Aires” by an Argentinean composer Martin Palmeri with İzmir State Symphony Orchestra and State Polyphonic Chorus under the baton of Alessandro Cedrone in the 40th Anniversary Closing Concert of İzmir State Symphony Orchestra, Ephesus Antique Theater (Selçuk). Appearing on the Mansing world list of contemporary tango musicians since 2004, Salman plays the bandoneon signed AA, showing that it was built by Alfred Arnold (1932). Restored by the German expert, Carlsten Heveling, this bandoneon originally belonged to the famous Turkish bandoneon virtuoso and conductor Orhan Avşar and was presented to Salman by the architect Abdullah Ebussuutoğlu following his bandoneon recital in İstanbul. 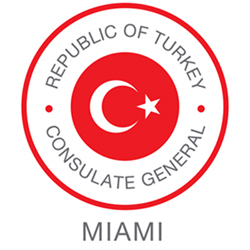 Tolga Salman’s participation is co-sponsored by the Turkish Airlines and Turkish Consulate General in Miami.